This treat for the entire family comes complete with hot chocolate, a visit with Santa, and a joyful holiday concert featuring Mainstage Center for the Arts’ professionally-staged and choreographed show choirs, Harmony and Encore; its Dance Company; Musical Theatre and Performance Company; and more. 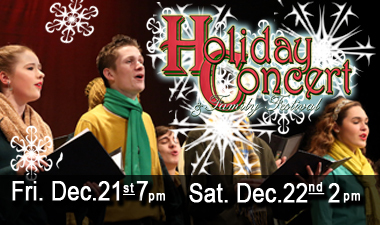 The concert begins at 7:00 p.m., December 21, and 2:00 p.m., December 22 in Lincoln Hall and the Dennis Flyer Theatre, Camden County College, Blackwood, NJ. Doors will open for festival activities one hour before each show time. Tickets are $16 for adults and $13 for children under 12/senior citizens. For nominal additional fees, those attending can participate in an ornament-making station and a cookie fundraiser to benefit Harmony's summer performance tour. Family Holiday Activities Start one hour prior to concert start time.